KIEV, Ukraine -- Ukraine is ready to discuss cooperation with Moscow in upgrading Ukraine's gas transit system, Ukrainian Prime Minister Mykola Azarov said on Thursday. "We are ready to discuss the modernization of gas transportation system," he said at a meeting with visiting Russian First Deputy Prime Minister Igor Shuvalov. Azarov noted that the Ukrainian gas pipeline system can transport about 150 billion cubic meters of gas annually, and if upgraded, its transit capacity could increase to 200 billion cubic meters. "To upgrade the current gas pipeline system would be a lot cheaper than to build new one," the Interfax-Ukraine news agency quoted Azarov as saying. Meanwhile, Azarov urged the Russian side to lower natural gas prices for Ukraine. In addition, he pointed out that Ukraine is also ready to deepen economic cooperation with Moscow, particularly in the nuclear industry, aerospace and shipbuilding. Shuvalov, in turn, said that it was in the fundamental interests of both countries and their peoples to further strengthen bilateral cooperation in various fields. He noted that experts from the two countries are discussing conditions and prices for modernizing Ukrainian gas transit network. 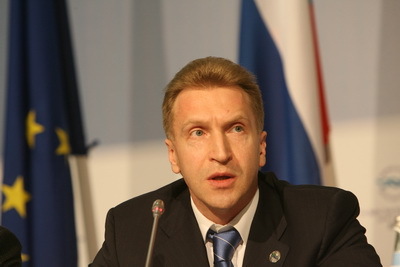 "I believe both sides will eventually reach an agreement based on mutual benefits," Shuvalov added.